My first impression of Rome was perhaps not the most favourable. We caught a shuttle to the Termini main station and walked, from there, to our accommodation off of Piazza Vittorio. Within five minutes of disembarking, I had seen three rats, a lot of rubbish and there was a pervasive smell of urinal – and not a terribly clean one. The area that our accommodation was in was also not a typically Italian area. The accommodation itself however, was fine, booked through Airbnb and exactly as expected. It also had the advantage of being only a 10 minute walk from the Colosseum. 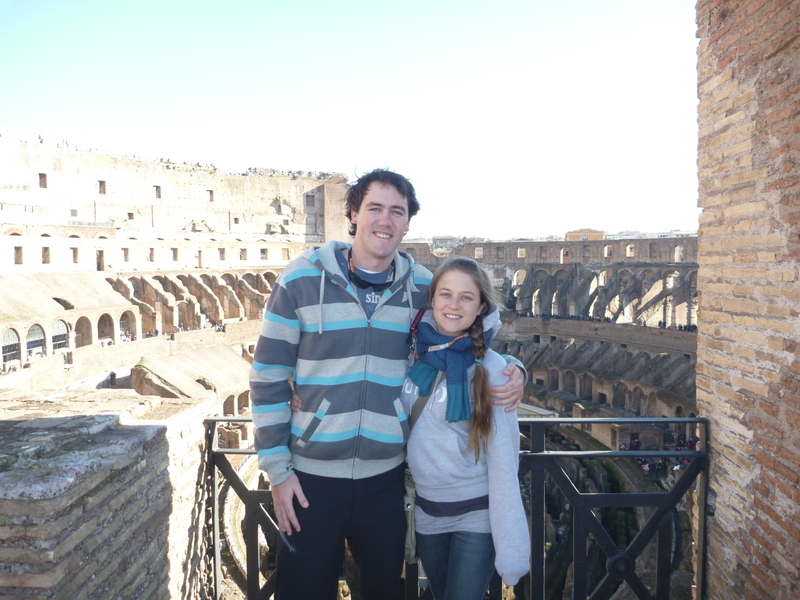 After dropping our bags we took advantage of this and wandered down toward the Colosseum to find some food. A lot of wise travel oracles will tell you to avoid eating around the Colosseum because it is too touristy. They seem to ignore the fact that 1) Huge tracts of Rome are pretty touristy and 2) That even if the food standard is not 5-star, 3-hat, 7.5-whisk or whatever – it is pretty freakin’ amazing to be sitting outside, smack-bang next to the Colosseum with your pizza and glass of red. These sandals were made for walking My first impression was quickly replaced by general awe and wonderment the next day as we explored the city by foot. Rome is an amazing place where you see something incredible around almost every corner… and that is on the dull streets. In most cases the incredible thing is nestled amongst a plethora of beautiful, amazing, and stunning things… gorgeous statues, beautiful piazzas, old churches, magnificent ruins and so on. First stop… the Fontana di Trevi. It was about 9:00am by the time we got there but being winter, there were fortunately still only a handful of people there- this was not the case back when we went back later in the evening! 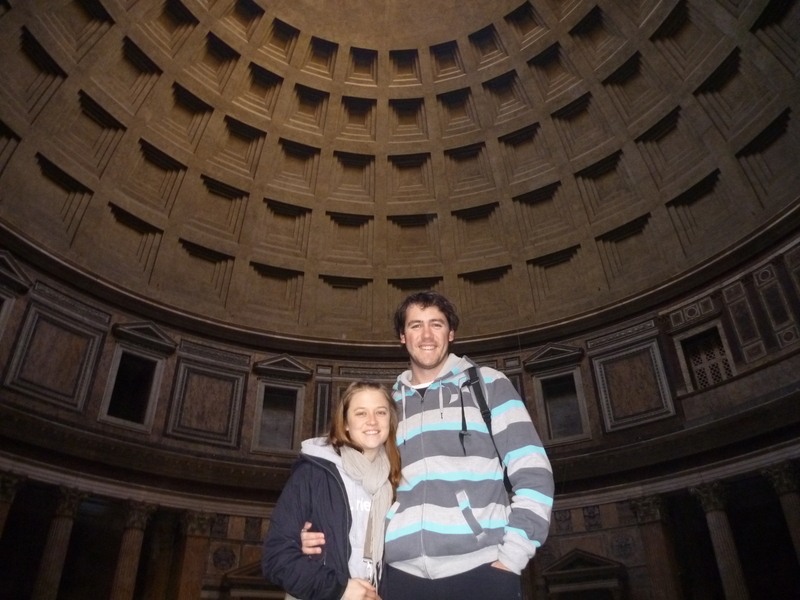 From there we visited one of my favourite places- the Pantheon. This majestic domed building is nestled at the end of a fairly small piazza and, for me, was the best example of how the tiny, twisting cobbled streets seem to belie the possibility of the treasures hidden around every corner. We were so impressed with the Pantheon that we decided to have a coffee on the piazza. We do not drink coffee so it was really just a chance to exercise the adage ‘When in Rome’- in Rome! (This phrase was tossed about a bit over the three days in Burgundy-esque style). The experience was lovely, the coffee was meh, but ordering a green tea and a coke didn’t seem fitting for our first piazza experience. From there we saw the Piazza di Navona, Campa di Fiori, and walked through the impressive Hadrian fortress, the Castel Sant’angelo. Lunch stop for a four-cheese gnocchi and pepperoni pizza, and we were off to Gladiator School! The Gladiator School was about six kilometres away from our accommodation so we had taken some careful google map screen shots (too pov to pay for data overseas!) while we had wi-fi and followed these toward our destination. Just around the corner from our destination and with half an hour up our sleeves, and disaster struck. We arrived at un un-walkable section of motorway (part of the Appian way)- blind corners, no shoulder, very fast cars and a tunnel. We had no choice but to leg it a kilometre back up the hill from whence we’d come and to try and flag down a taxi. As is always the case when you are pressed for time, the very few taxis we did manage to flag down refused to take us; they didn’t know the place, it was too close, not worth the effort- who knows! One guy wasted several minutes of our time while he worked out where it was and then told us he was finished for the day. Fortunately, with only minutes to spare – and not before Ryan had chucked a small tantrum – we found a saintly taxi driver who delivered us safely to our destination. We were, however, frustrated to realise that had only been a stone throw away, when the motorway and the voice that says ’Would your mum approve of you doing this?’ stopped us from walking the last few metres. Gladiator School was as super-awesome as it sounds. The school is run by an ancient Roman re-enactment society and the first hour was spent learning about the Roman army and the gladiators in a museum which includes weapons and armour that the re-enactment society have made. The second hour was spent out in the training yard learning basic offensive and defensive moves with wooden swords- lots of fun. Once we had mastered these, our wooden swords were replaced with a newspaper/gaffa tape creation less likely to cause damage, and we were ready to fight! Despite the fact that Ryan is over a foot taller than me and has the reach of a giant squid, I held my own quite well! 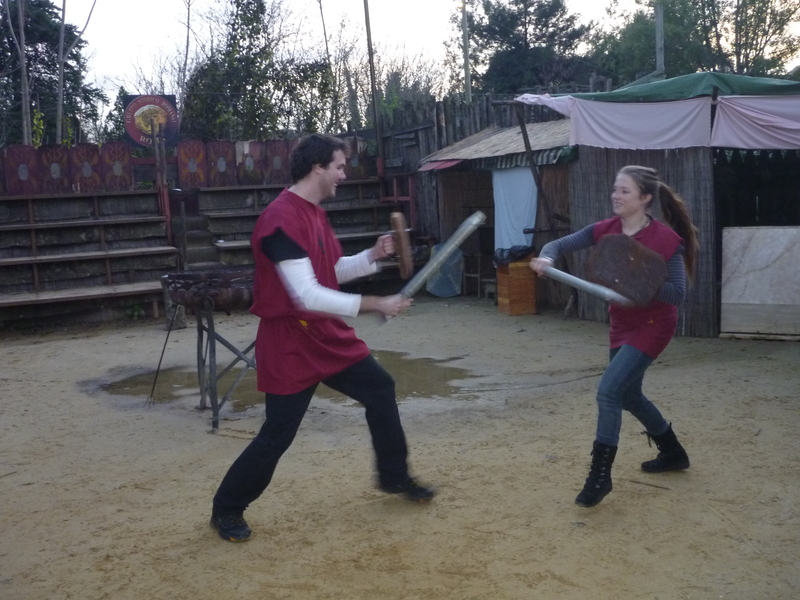 We had lots of fun getting to bash each other with swords (a lifelong dream of Ryan’s I think)… the other couple fighting didn’t seem to embrace the chance to stab and slice each other with the same level of enthusiasm. I did, however, have to yell at Ryan when he started punching me with his shield – not something we were taught in training! Tired from all the fighting and with a good 20 kilometres of walking already under our belts, we caught a taxi back into the city centre to explore the Roman Forum and Piazza Venezia area by night before tucking into a well earned pizza/pasta by the Fontana di Trevi. Blessed are the cheesemakers On the second day we visited the Vatican Museum/ St Peter’s Basilica on a Dark Rome tour. The tour was a great option for two reasons 1) We avoided the mammoth queues (literally around the block) 2) The guide offered a lot of really interesting facts and anecdotes about the Vatican, the Sistine Chapel and the Basilica – much more entertaining than an audio guide. This was the busiest place we’ve visited and most of the three hours was spent shoulder to shoulder. Without sparking a huge theological debate, I didn’t really love the Vatican. The art was beautiful but I feel quite uncomfortable with the Catholic Church from an institutional point of view and I certainly felt this while I was there. I do not think you will find a place on earth that better evidences material wealth, or houses more icons and idols than the Vatican. Much more Pope than God and much more temporal than spiritual – for me. I was glad to have visited but if I had my time over I would probably spend the time on a day trip to Pompeii instead. We lunched near the Spanish Steps and then (lesson learned about walking) took a taxi out to the San Callisto Catacombs. The catacombs were very impressive but unlike the Parisian catacombs, do not house any actual bones. The day was topped off with an Eggplant Parmigiana and another Pepperoni pizza. Colosseo We saved the best for last and visited the Colosseum on our final day. The actual reason we waited was because it was the only day we could get onto one of the tours that allows you to visited the underground section of the Colosseum as well as the third tier. Only 250 people a day are allowed into these sections (spread over 10 tours). It was absolutely magnificent. There is a small section on the ground level where they have created a small section of arena floor, and stepping out onto this was a truly breathtaking experience, especially as you are one of only 25 people so there is lots of space to walk around and enjoy the majesty of the Colosseum rising above you. From there we visited the underground section and got to see the where all of the animals and people waited before entering the arena as well as the remains of infrastructure; such as winches used to hoist cages up and down, or sets in and out of the arena. As they unlock the gates to let you up to the third tier, dozens of people gather at the bottom of the stairs with a ‘how did they get up there?’ look on their faces. The guide suggested that this is the best part of the tour for many but I am quite soft so I felt a little bit bad… I know I’d be jealous if I was at the bottom of the stairs. And jealous with good reason. The view from the third section is beautiful. It overlooks the Roman Forum and Palatine Hill but also gives you a near bird’s eye look into the foundations of the Colosseum. Once the tour had concluded, in the Roman Forum, we explored Palatine Hill before heading off to a restaurant that had been recommended by an old school friend (on hear say). The culinary standout of our visit, it did not disappoint at all! Sora Lella is located on the Isola Tiberina and is a proper restaurant, as opposed the cafe style restaurants that are around all of the major attractions. We enjoyed a beautiful late lunch here and followed the Italian tradition of ordering pasta as a first course… my tummy and waistline could not handle this every day. I enjoyed a beautiful main course of Eggplant Parmigiana with ricotta, walnuts and honey. Ryan had a spectacular looking serve of lamb and potato, and waved a sparkling clean bone in my face as evidence of the lamb’s perfection. Add a couple of bottles of wine and this was the perfect way to finish our first (certainly not the last) visit to Rome. This entry was posted in Matryoshka, White Christmas and Reindeer Burgers, Travel and tagged Colosseum, Italy, Rome. Bookmark the permalink.